Technology evolves at a dazzling speed, and nowhere more so than in the field of genetic engineering, where the possibility of directly changing the genes of one’s children is quickly becoming a reality. The public is rightly concerned, but interestingly, they have not had much to say about the implications of recent advancements in human genetics. Playing God? asks why and explores the social forces that have led to the thinning out of public debate over human genetic engineering. John H. Evans contends that the problem lies in the structure of the debate itself. Disputes over human genetic engineering concern the means for achieving assumed ends, rather than being a healthy discussion about the ends themselves. According to Evans, this change in focus occurred as the jurisdiction over the debate shifted from scientists to bioethicists, a change which itself was caused by the rise of the bureaucratic state as the authority in such matters. The implications of this timely study are twofold. 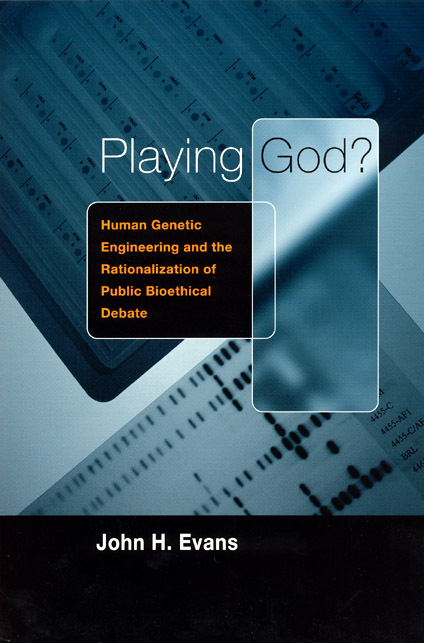 Evans not only explores how decisions about the ethics of human genetic engineering are made, but also shows how the structure of the debate has led to the technological choices we now face.